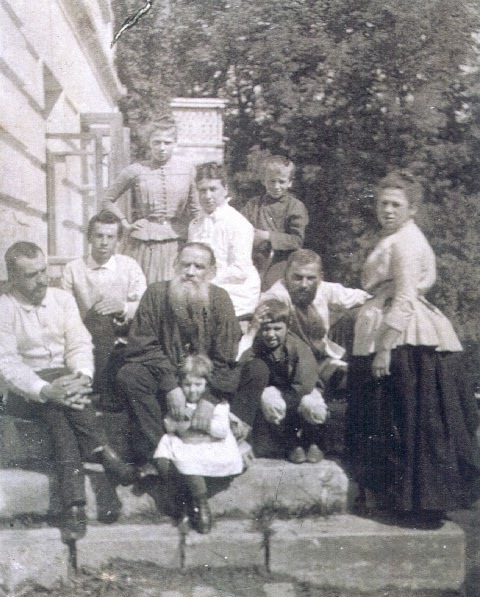 From my earliest childhood until the family moved into Moscow — that was in 1881 — all my life was spent, almost without a break, at Yasnaya Polyana. This is how we live. The chief personage in the house is my mother. She settles everything. She interviews Nikolai, the cook, and orders dinner; she sends us out for walks, makes our shirts, is always nursing some baby at the breast; all day long she is bustling about the house with hurried steps. One can be naughty with her, though she is sometimes angry and punishes us. She knows more about everything than anybody else. She knows that one must wash every day, that one must eat soup at dinner, that one must talk French, learn not to crawl about on all fours, not to put one's elbows on the table; and if she says that one is not to go out walking because it is just going to rain, she is sure to be right, and one must do as she says. Papa is the cleverest man in the world. He always knows everything. There is no being naughty with HIM. When he is up in his study "working," one is not allowed to make a noise, and nobody may go into his room. What he does when he is at "work," none of us know. Later on, when I had learned to read, I was told that papa was a "writer." This was how I learned. I was very pleased with some lines of poetry one day, and asked my mother who wrote them. She told me they were written by Pushkin, and Pushkin was a great writer. I was vexed at my father not being one, too. Then my mother said that my father was also a well-known writer, and I was very glad indeed. At the dinner-table papa sits opposite mama and has his own round silver spoon. When old Natalia Petrovna, who lives on the floor below with great-aunt Tatyana Alexandrovna, pours herself out a glass of kvass, he picks it up and drinks it right off, then says, "Oh, I'm so sorry, Natalia Petrovna; I made a mistake!" We all laugh delightedly, and it seems odd that papa is not in the least afraid of Natalia Petrovna. When there is jelly for pudding, papa says it is good for gluing paper boxes; we run off to get some paper, and papa makes it into boxes. Mama is angry, but he is not afraid of her either. We have the gayest times imaginable with him now and then. He can ride a horse better and run faster than anybody else, and there is no one in the world so strong as he is. He hardly ever punishes us, but when he looks me in the eyes he knows everything that I think, and I am frightened. You can tell stories to mama, but not to papa, because he will see through you at once. So nobody ever tries. Besides papa and mama, there was also Aunt Tatyana Alexandrovna Yergolsky. In her room she had a big eikon with a silver mount. We were very much afraid of this eikon, because it was very old and black. When I was six, I remember my father teaching the village children. They had their lessons in "the other house*," where Alexey Stepanytch, the bailiff, lived, and sometimes on the ground floor of the house we lived in. There were a great number of village children who used to come. When they came, the front hall smelled of sheepskin jackets; they were taught by papa and Seryozha and Tanya and Uncle Kostya all at once. Lesson-time was very gay and lively. The children did exactly as they pleased, sat where they liked, ran about from place to place, and answered questions not one by one, but all together, interrupting one another, and helping one another to recall what they had read. If one left out a bit, up jumped another and then another, and the story or sum was reconstructed by the united efforts of the whole class. What pleased my father most about his pupils was the picturesqueness and originality of their language. He never wanted a literal repetition of bookish expressions, and particularly encouraged every one to speak "out of his own head." *The name given to the stone annex.